Echo by artist Jaume Plensa. Image license: The Seattle Art Museum. © Copyright 2014 Benjamin Benschneider All Rights Reserved. When discussing the Seattle arts landscape, the conversation has to begin with Seattle Art Museum (*1300 First Ave; seattleartmuseum.org), dubbed SAM by locals. It’s a bastion of diversity and quality, where you can find classic masterworks and modern creations with social importance. 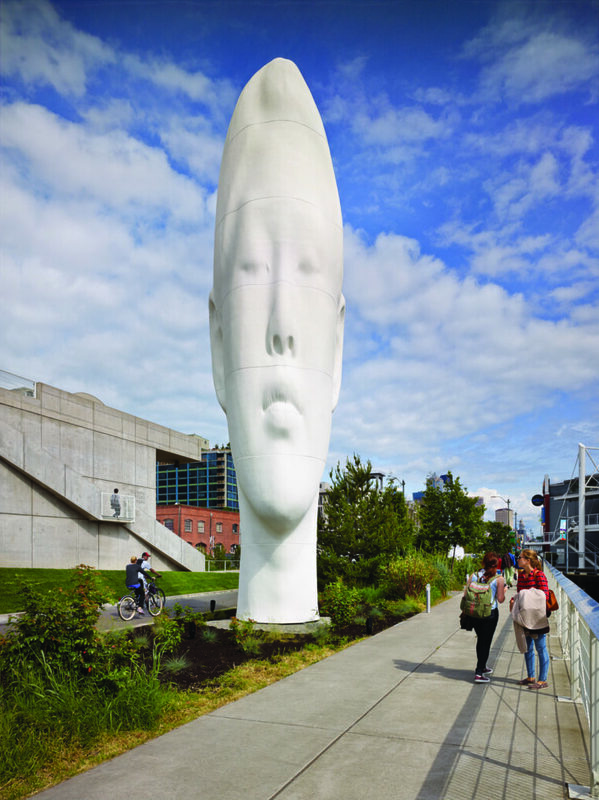 If you want to get outside, SAM’s Olympic Sculpture Park (*2901 Western Ave) offers outdoor marvels for your viewing pleasure. SAM also runs the Seattle Asian Art Museum (*1400 E Prospect St) situated in Capitol Hill’s Volunteer Park, which presents ancient artwork and modern exhibits. But it’s not the only museum tapping into Seattle’s cultural heritage. There’s also the excellent Wing Luke Museum (*719 S King St; wingluke.org) and Northwest African American Museum (*2300 S Massachusetts St; naamnw.org). Frye Art Museum (*704 Terry Ave; fryemuseum.org) on First Hill tempts with free admission and thought provoking exhibits. The Museum of History & Industry (*860 Terry Ave N; mohai.org) can orient you to the history of the region and entertain young and old with its creative special exhibitions which have recently covered a range of subjects as diverse as hip hop, vintage toys, Prohibition, and chocolate. Out of all mediums, one of the most signature in Seattle is glasswork. The titan of Pacific Northwest glass is Dale Chihuly, and Chihuly Garden and Glass (*305 Harrison St; chihulygardenandglass.com) serves as a shrine to his blown-glass masterworks. Outside of the museum space, Seattle’s abundance of art galleries can best be taken in during monthly neighborhood art walks. First Thursday Art Walk (pioneersquare.org/first-thursday-art-walk) in Pioneer Square and the second Thursday Capitol Hill Art Walk (capitolhillartwalk.com) are great places to start.